WSU players and fans celebrate on the field following the victory over 4th ranked USC. 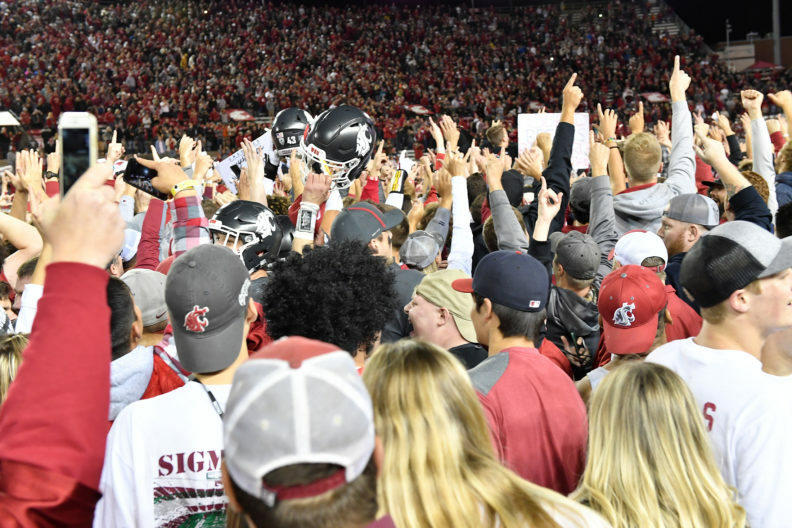 Friday night’s 30-27 upset win over fifth-ranked USC thrust WSU into a national limelight that continued to shine throughout the weekend as the Cougars climbed to No. 11 on the latest Associated Press Top 25 poll. Here’s a sampling of reactions from around the country along with a quick video recap of game highlights. Check out Friday’s highlights in this great recap from WSU Athletics Sports Video. NEXT UP: The undefeated Cougars embark on their first road game of the season, traveling to Eugene for a Saturday showdown with Oregon (4-1, 1-1 Pac-12).